This is a story about a big problem, writ small. The big problem is this: We can’t let go of the scripts and roles that have been assigned to us [or that we’ve assigned ourselves] and see the unscripted opportunities that are often right in front of us. Or, in the story I’m about to tell, right behind our backs. This problem is the reason governments bog down along partisan political lines and become vulnerable to over-confident bullies. It’s the reason marriages break up, families grow distant, and the social compact fractures along the fault lines of its gradients–tribes, communities, religions, states. It’s the problem that keeps teams from becoming better than the sum of their individual talents, organizations from innovating, and start-ups from evolving into sustainable companies. It’s why new ideas fall victim to operational urgencies, and get bogged down by legacy thinking. It’s the reason retailers will continue to feel Amazon-induced pain. The reason Millennial and Gen Z employees, change-craving adaptors, find old systems stifling and grow impatient quickly. It’s why brands find it hard to transform from consumerist marketing into lifestyle and social impact marketing. It’s the reason women and people of color clash with the white privileged patriarchy. The reason so many citizens in a country built and fueled by immigrant energy can’t feel empathy for the tired, the poor, the huddled masses yearning to be free. It’s why heterosexuals are threatened by queer sexuality and non-binary genders. Why we have hard time discerning between sexual assault or harassment and a really bad date. If we could choose only one remedy in order to evolve culturally, this would be a good problem to solve. 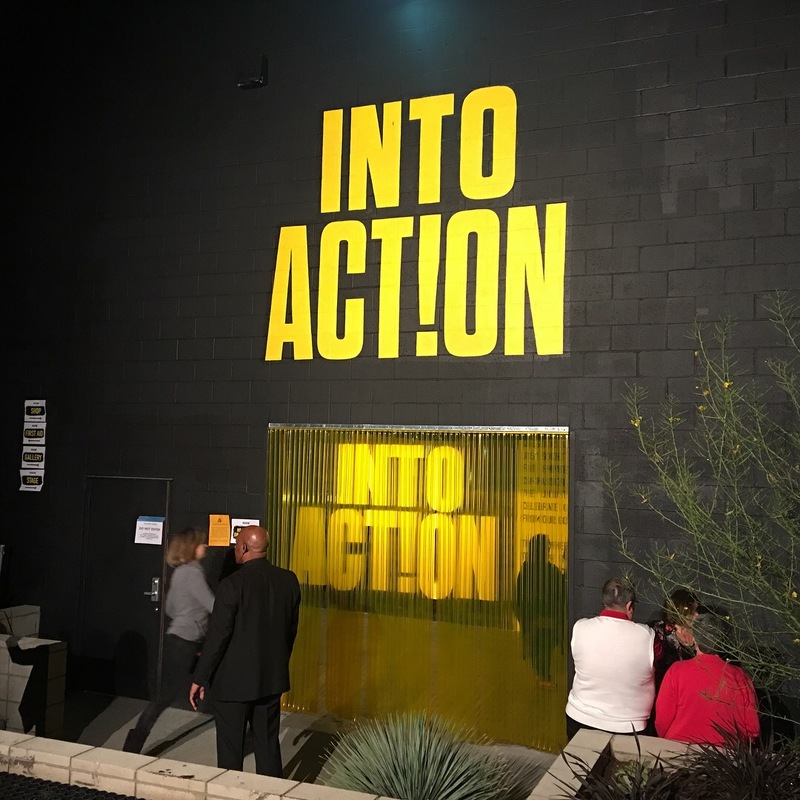 Last week, a good friend of mine, his date, his son, and I attended the opening of a huge social activist art exhibit called IntoAction in downtown Los Angeles. My friend’s son had a painting in the exhibit. We arrived at around 8pm. It was a good night. We ran into a lot of artist and activist friends. The art was powerful, surprising, inspiring. I got to meet Brandan ‘BMike’ Odums, whose awesome Studio Be exhibition in New Orleans I’d visited last year. BMike’s art was part of the exhibit, too. By 10:30, we were ready to leave. 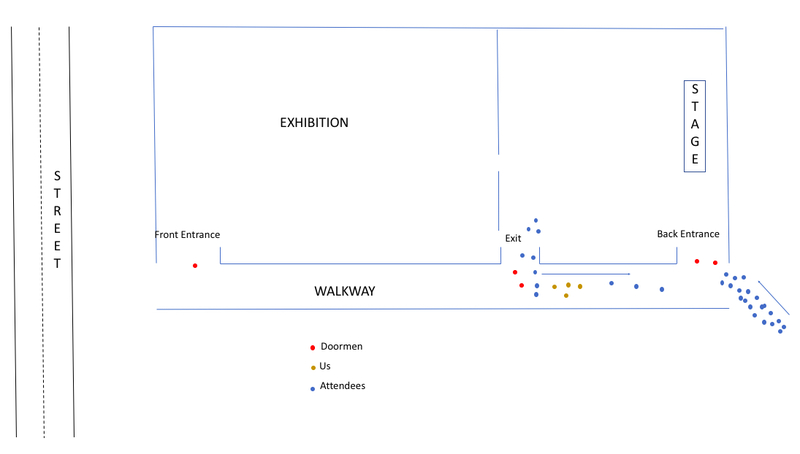 We left the exhibit building through a door that led to a walkway. 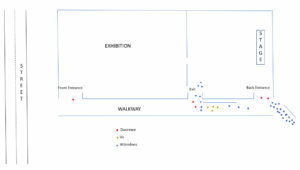 At either end of the walkway were entrances to the exhibit. The back entrance, which led to the stage area where Van Jones was speaking and The Black Eyed Peas were to perform later, had a line of people waiting to get in. The front entrance had no line. 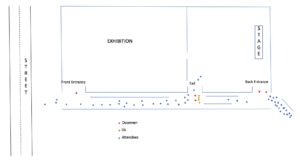 In the diagram, we are the yellow dots. 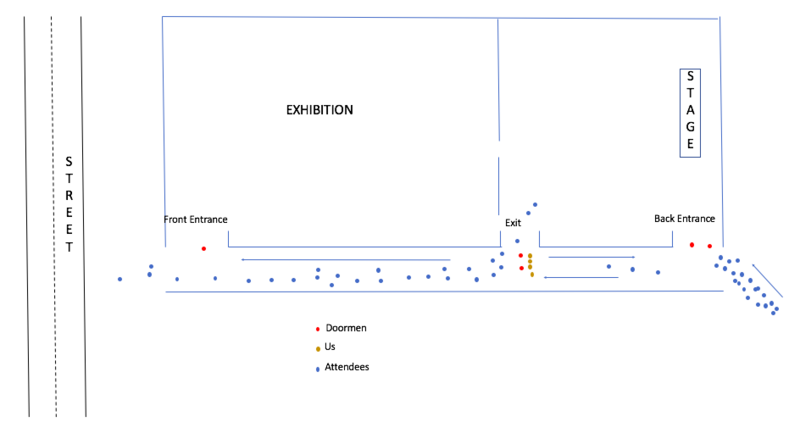 We were directed by two young doormen in jackets and ties [red dots in the diagram] to exit toward the back of the building. There were two problems with this: the street, where our Lyft was waiting, was in the opposite direction; and the line of people waiting at the back entrance blocked our path. My friend, who is relentless about calling out bad design in any context, turned around and the four of us headed back up the walkway in the direction of the street. The two doormen confronted us. Told us we weren’t allowed to go in that direction, that we had to egress past the back entrance. It got loud. Confrontational. The older of the doormen stepped to my friend, and my friend didn’t back down. They got in each other’s faces. “Who do you think you are? Obama? !” snapped the take-charge doorman. “No, m_____f____, I’m a man who wants to get to his car, and my car is that way!” my friend shot back, indicating the direction of the street. The older doorman called for his boss, a woman standing nearby. She wanted no part of it. Walked away. “I’m friends with Yosi! Call him up!” crowed my friend. Yosi is the IntoAction organizer. This is when I noticed what was happening behind the doormen. People were pouring out of the exit by the dozens, and heading toward the street. The direction the doormen weren’t allowing us to go. To his credit, the younger doorman stepped aside and before the older guy could stop him, said, “I guess we have to let you go that way.” The other doorman fumed and sputtered. He and my friend, and my friend’s son kept up their jawing as we walked away, now with the flow, not against it. I couldn’t resist tossing a dart of my own. “Lots of Obamas out here tonight!” I hooted. There was practically zero consequence to this confrontation. Most of us have butted heads with petty officials like this, people who make up for low pay or temp jobs by wielding whatever authority they have like it’s a weapon. But it reminded me of so many consequential disagreements in the contexts I listed above. We have a script for how things should be. The script makes sense on paper. In rehearsal. Leadership approves. The script defines roles, assigns responsibilities, status, authority. And then, when put into action, when tested by reality, there’s a hitch. Something unexpected happens. In this story, what was unexpected was that, at a certain time of night, a line of people at the back entrance would block the path of the people like us, who were, according to the script, supposed to exit that way. And then, because egos are on the line, and the fear of criticism by one’s boss sets in, doing things any other way seems impossible. The ego gets in the way, because the ego loves authority, even if there’s a better way right next to us, or right behind our backs. The ego doesn’t want to back down from whatever status it has. The ego says any sure thing, even if it’s less than optimal, is better than any unknown. The way things have always been is better than the iffiness of trying anything new. Pretending to know is more comforting than the missteps that come with learning. The ego-stroking certainty of a Mar a Lago is better than the humility and compromising required to pass a federal budget. Put your money on the ‘Younger Doormen.’ On people who can set aside their titles and their vanity and the scripts they’ve been handed, adapt to unplanned opportunities, seize on serendipity, and guide us to a better way. They are the ones we’ve been waiting for.